Every year the TOFGA annual conference features speakers on a variety of topics in the organic farming, gardening, and ranching world, as well as the marketing, management, and policy realms. We hope you will join us January 12-14, 2017 in Mesquite, Texas for this exciting opportunity to learn, network, and build community around organic practices in Texas! List last updated: 1/1/17 Register NOW! 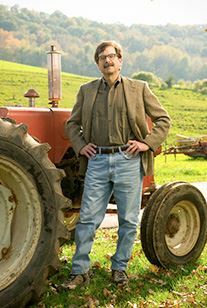 Mark Kastel is co-founder and Senior Farm Policy Analyst of The Cornucopia Institute, a farm policy research group based in Wisconsin. For almost 20 years prior to Cornucopia’s launch his professional practice included political consulting, lobbying on behalf of family farm groups, and business development work benefiting family-scale farmers. Mr. Kastel has played a key role in a number of cooperative ventures designed to empower farmers in the marketplace. His development work has focused on creating sustainable farmer-owned businesses with an emphasis on dairy production and marketing. Kim Aman aka "Farmer Kim" is a Garden Educator working towards getting kids' hands deep in the dirt. She is a teacher by trade and a farmer by passion. Her work includes Program Director at Moss Haven Farm, Educational Coordinator of Dallas Farmers Market, Garden Community Manager and Curriculum Writer of American Heart Association, Teaching Gardens/Whole Kids Foundation, and VP of Dallas Farmers Market Friends. Sue Beckwith is the Executive Director of the new Texas Center for Local Food and a project manager for local food and sustainable agriculture projects in Texas. Through work for the City of Elgin and NCAT, Sue helps develop local food enterprises that support Texas sustainable agriculture and rural job creation. Sue is past president of TOFGA and was the start up project manager for Coyote Creek Organic Feed Mill, the only certified organic commercial feed mill in Texas. She lives in Elgin. Larry Butler and co-owner Carol Ann Sayle have been urban vegetable farmers in Austin for 25 years at Boggy Creek Farm. Larry is known for his innovative on-farm engineering. Boggy Creek hosts several weekly on-site markets and numerous community events throughout the year. Judith Canales is State Executive Director for the Texas Farm Service Agency where she oversees all aspects of federal farm program delivery. She has also served as Acting Deputy Under Secretary and Administrator for the Rural Business-Cooperative Service for USDA Rural Development, Executive Director of the Maverick County Development Corporation in Eagle Pass, Deputy State Director for Texas Rural Development, and Executive Director of International Hispanic Network. Dr. Dave Celella earned his DVM from Texas A&M in 1989. He opened Rockwall Equine Center in 1992 and was recognized as the TVMA Equine Practitioner of the Year in 1999. He recently added a small animal pet practice at Poetry Animal Hospital in the same location. He is a member of the AAEP and past President of the Appaloosa Cutting Horse Association. Dave is also an accomplished western artist and sculptor. Lauri Celella graduated in HMI’s 2013 class of Beginning Farmers and Ranchers, Women in Texas. Along with her husband, veterinarian David Celella, she runs Dry Creek Livestock with Dorper sheep and Devon cattle near Terrell, Texas. Clarice Criss is owner of Nella Roots Gardening in Dallas. When she isn’t designing and installing landscapes for others, she’s revitalizing a community garden in South Dallas, selling and giving away fresh food with the desire to make an impact in the food choices of the community. Nelson T. Daniels, PhD, is a Program Specialist in Ag & Natural Resources at the Cooperative Extension Program at Prairie View A&M University. Patrick Dickinson is Program Coordinator for Texas A&M AgriLife Research & Extension Center in Dallas. He has a BS in Horticulture from Tarleton State University, is an ISA Certified Arborist and TCEQ Licensed Irrigator, and has over 15 years experience in the Texas horticulture industry. Patrick is part of the Water University Program that falls under Texas A&M Agrilife Research and focuses on water conservation and stormwater issues through training and education programs. Patrick provides information about sustainable landscape water use from design and plant selection to water-conserving landscape management practices. Justin Duncan has a BS in Agronomy from Prairie View A&M University, an 1890 Land Grant Institution, and an MS in Plant Breeding from Texas A&M University. He’s spent years figuring out the nuts-and-bolts of successful organic farming in the humid South, concentrating mainly on sweet potatoes, strawberries, niche market ethnic crops, and drought mitigation techniques. He formerly served as the Houston regional director of TOFGA and has strong rapport with organic farmers in Eastern Texas. Kevin Ellis has been a poultry specialist on the NCAT staff for the last three years. He has written and revised publications regarding organic poultry production and pastured egg production and given presentations on poultry biosecurity and predator management directly to farmers in Iowa, Missouri, and Texas. Kevin has successfully completed organic livestock inspector training through the International Organic Inspectors Association. Brian Findeisen is a fifth generation farmer/rancher from Sealy, Texas, and is co-founder of Erbe Ranch. In 2014, after obtaining a degree in Microbiology and working in the corporate world, his family took a leap of faith to start a non-conventional ranch on family land. Brian, his wife, and two young sons raise cattle, chickens, and pigs on pasture, fresh air, and sunshine. Erin Flynn is an agricultural activist and co-creator of Green Gate Farms, an award-winning, certified organic community farm and New Farm Institute, the farm's nonprofit farm-based education center. With locations in Austin and Bastrop, the farms have cultivated good, clean, fair food, community, and farmers since 2006. April Harrington founded Earth Elements Farm in 1998. Today, she mentors startup food entrepreneurs and farmers in value-added local products and she owns the Earth Elements Entrepreneurs’ Kitchen. Lorig Hawkins has farmed in Central Texas since 2010, beginning as an intern at Urban Roots, then working with Tecolote Farm and Boggy Creek Farm. In 2014 she helped establish and manage the 3-acre farm for Farmshare Austin as the Farm Programs Director. Currently she is a graduate student at Texas State University working on a Master’s in Agricultural Education. Her thesis involves a variety trial project for Central Texas. Stephen Kraemer owns and operates Buena Tierra Farm in Fredonia, TX. By taking advantage of naturally fertile Central Texas soil, his small, family-owned farm has grown everything from radicchio to bell peppers to squash using purely organic, traditional methods. Stephen has created numerous farming implements on his farm and has spent years dialing in his farming methods including weed management. Paul Magedson started Good Earth Organic Farm in 1984 which was one of the first certified organic farms in Texas. They grow organic fruits and vegetables and raise organically grazed, 100% grass-fed lamb. They share their best practices with others by teaching sustainable farming techniques to school kids and interested individuals through tours, classes, workshops, and consultations. Robert Maggiani was an organic vegetable farmer in South Texas and Northern Mexico in the 1970’s and 1980’s and worked for the Texas Department of Agriculture (TDA) as Chief of Marketing for 27 years. He was the first staff person at TDA to be assigned to the effort to start an organic certification program in 1987, and in 1989 Texas became only the second state in the country (after California) to have its own organic certification program. He is now a Sustainable Ag Specialist with NCAT and a member of the TOFGA Board of Directors. Hunter Mangrum's background spans many fields and disciplines, allowing him to bring a diverse approach to the current state of the food system of Texas. He spent over 6 years in higher education sustainability with a major focus on food systems. Currently working for Hardie's Fresh Foods, Hunter is involved in a variety of projects, from FSMA compliance and GAP training to crop planning and product packaging, all of which are centered around leveraging local growers, growing their share of the marketplace, and helping to build a more sustainable future for Texas food. Susie Marshall is Executive Director of GROW North Texas and has 13 years experience in local food systems including both food access and food production. She is passionate about local food systems that provide enough healthy food for people and adequate prices for food producers. Dr. Joe Masabni’s area of expertise is vegetable production for small-acreage producers. His research interest is to develop production systems for high tunnel vegetables, aquaponics production, and pesticide and variety trials. Extension activities include developing online and printed materials for vegetable producers and homeowners, hosting workshops and conferences, and assisting county extension agents serving Texas clienteles. Greg Mast manages the Central Texas Food Bank Learning Garden, a 1.25 acre sustainable urban farm in Austin. He is an ISA Certified Arborist and has over 20 years of experience growing food in Texas and the Southwest. Chef Matt McCallister opened FT33 in October 2012. He quickly guided the restaurant to local and national acclaim, including a glowing five-star review from Dallas Morning News, Restaurant of the Year by D magazine, recognition by Bon Appétit, 2014 Food & Wine Best New Chef, and multiple semifinalist nods from the James Beard Foundation. Matt built the success of FT33 on high-quality ingredients presented in inventive, artful dishes, on par with world-class restaurants around the globe. His second restaurant, Filament, opened December 2015 in Dallas’ Deep Ellum and honors simply prepared ingredients of the South with a casual approach to dining. Bill McCranie has been practicing and studying biodynamic methods and procedures in excess of 15 years. He is a board member of Josephine Porter Institute for Applied Biodynamics. He is also farming and ranching on the only Demeter Certified biodynamic farm or ranch in Texas, which is certified organic as well. Brandy McDaniel is a wild plants and medicines enthusiast and brings personal, family, and historical knowledge forward to today's world. Mike Milligan is proprietor, flower harvester, delivery man, master of the spreadsheets, comic relief and manager of the annual planting program at Prickly Pair Farm. Glen Miracle and his wife Kenan Rote operate Laughing Frog Farm in Hempstead, Texas, a small permaculture based farm where they moved in 2003. The farm sells chicken eggs and meat, lamb meat and wool, fruit trees, and vegetables. Glen grew up in a farming community in Berea, KY. His grandfather was a cattle and tobacco farmer and many family members were and are farmers. In 1978 he started a small front yard garden in Houston, while he was part owner and resident artist at Houston Stage Equipment Corporation, a company that built and painted scenery for the Houston Grand Opera, Houston Ballet, and others. Business experience combined with the necessary creativity of that occupation helped with speculative and experimental problems faced in trying different and unconventional farming methods. Cameron Molberg joined World’s Best Eggs in 2010, serving as CEO and General Manager. His educational background in institutional management, animal science, and food technology has supported his work at Coyote Creek, the first certified organic feed mill in Texas and the largest independently-owned organic pasture-based chicken farm in the Southern U.S. Cameron served as Treasurer of TOFGA, and he is currently on the board of the Cornucopia Institute. Known to some as an "encyclopedia in blue jeans," Cameron serves as a resource for farmers, consumers, and organizations across the country. He is committed to animal health and welfare causes as well as supporting others in their quest to learn more about local, organic, and ethical agriculture and food systems. Michael Mosley is restaurant sales manager at Johnson's Backyard Garden (JBG), a 200-acre organic vegetable farm east of Austin. He has helped spearhead JBG's restaurant sales program, and has connected local restaurants, schools, and private and public institutions to local, farm-fresh vegetables. Prior to working in agriculture, he spent many years working in San Francisco's restaurant industry. Michael hails from Mississippi, and his friends consider him a Southern Food connoisseur and esteemed home chef. Dr. Jim Muir was born in Africa, educated in the USA, and has worked on three continents. He is a biologist (Wheaton College), has agronomy training (University of Florida) with hybrid views on land husbandry. He is currently a grassland ecologist with Texas A&M AgriLife Research in Stephenville, and teaches part-time at Tarleton State University. Alex Racelis is Associate Dean for Community Engagement in the College of Sciences at UT Rio Grande Valley, and Assistant Professor of Agroecology and Resilient Food System at UTRGV's School for Earth, Environmental, and Marine Sciences. He also helps direct the Subtropical Organic Agriculture Research (SOAR) Partnership, a consortium of researchers, practitioners, and farmers and growers, all dedicated to the advancement and sustainability of agriculture in South Texas. Under Alex's guidance, UTRGV has recently launched both graduate and undergraduate degrees related to sustainable food systems, and is building on its designation as one of the premier Hispanic Serving Agricultural College and Universities in the U.S. For more information, please visit www.utrgv.edu/agroecology. Pedro Schambon is founder and president of My Father’s Farm in Seguin. He holds degrees in Accounting from Lindsey Hopkins School of Florida and Organic Agricultural Practices from Sena Institute Colombia. A certified organic producer since 2008, he manages 10 acres and 80 thousand square feet of greenhouses. He has consulted for Texas A&M for Overseas Training on Organic Practices in Guatemala for underprivileged farmers. He holds an OIOA Organic Inspector license and a USDA Certificate for Good Agriculture Practices & Handling Practices. MFF produce has been sold at Whole Foods, Central Market/HEB, Urban Acres, local restaurants, and a CSA program with the City of San Antonio, Baptist Hospital, and Metro Health department. Thomas Schroeder is a sustainable agriculture specialist with NCAT. He learned about ranching on his family’s cow calf operation just outside Abilene and is currently working on NCAT’s Soil for Water project. He has a BA in Anthropology and Philosophy from Marquette University and a BS in Agriculture from Texas State University. He spent the last three years working for family-owned certified organic vegetable farms in Central Texas. Rachel Spencer is the Farm to School Lead for the Southwest Region of USDA Food and Nutrition Services. She joined USDA with a Master’s Degree in Agricultural Economics from the University of Arkansas, experience working with FoodCorps, and a desire for everyone to eat fresh, healthy food. Wendy Taggart is co-owner of Burgundy Pasture Beef in Grandview, Texas. Since starting the company in 1999, she and her partner Jon Taggart have also opened Burgundy’s Local Grass-Fed Meat Market retail stores in Dallas & Fort Worth, offering freshly cut/chilled pasture-raised meats year-round. Justin Tuley is the District Farm Manager for IDEA Public Schools. For the past 5 years his role has been to develop and expand the campus farms and gardens into a nationally recognized farm to school program. His areas of developing passion and expertise are: Farm to Cafeteria connections, strategic farm planning, and farm/life efficiency hacking. Justin lives in Tyler, Texas with his wife and three young boys.